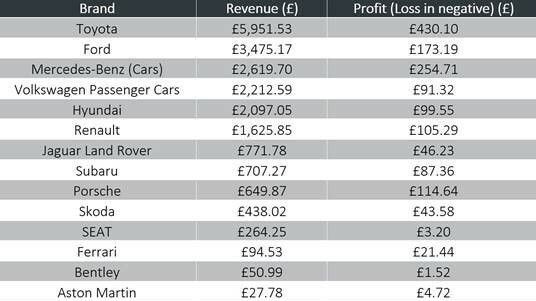 Toyota makes £430 profit every second according to a new interactive tool which highlights the revenue and profit of all the world’s 15 richest motor manufacturers. 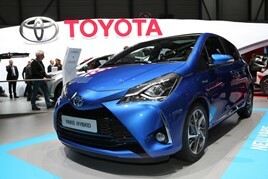 Its interactive asset produced by insurance firm Staveley Head revealed the extent to which Toyota leads the ranking of the most profitable players in the global car manufacturing, selling around 17 cars per minute. The Japanese manufacturer's revenue of almost £6,000 per second means it earns £1 billion every two days, Stavely Head said. However, Mercedes pockets more of a profit than Ford – the German brand earns £254.71 in profit every second, compared to Ford’s £173.19. In terms of luxury brands, Porsche leads the way in making the most revenue every minute, generating £38,992 every 60 seconds. Porsche is followed by Ferrari (£5,672) and Bentley (£3,059) as the high-end brands generating the most revenue per minute. In just 24 hours, Toyota sells 24,577 cars worldwide, Ford sells 18,101, Porsche sells 675, and Ferrari sells 23 (on average). As each brand closes up for the day, some have made a huge £37 million in profit. Ashley Peters, managing director of Staveley Head, said: “Next year will see further industry disruption with increased investment in electric car technology and the infrastructure to support them. There’ll also be additional government initiatives supporting the drives to create a low carbon economy and the banning sales of new petrol and diesel cars and vans by 2040. “We may therefore see a shift in leadership, with brands like Renault, Nissan and Tesla having been early adopters in electric car technology development, along with Jaguar Landrover and BMW, which have significantly increased their R&D in this area.